WASHINGTON (November 14, 2017) – With less than a month left before the National Flood Insurance Program expires, the National Association of Realtors® is applauding the House of Representatives for passing what NAR believes is smart, much-needed support for the program. 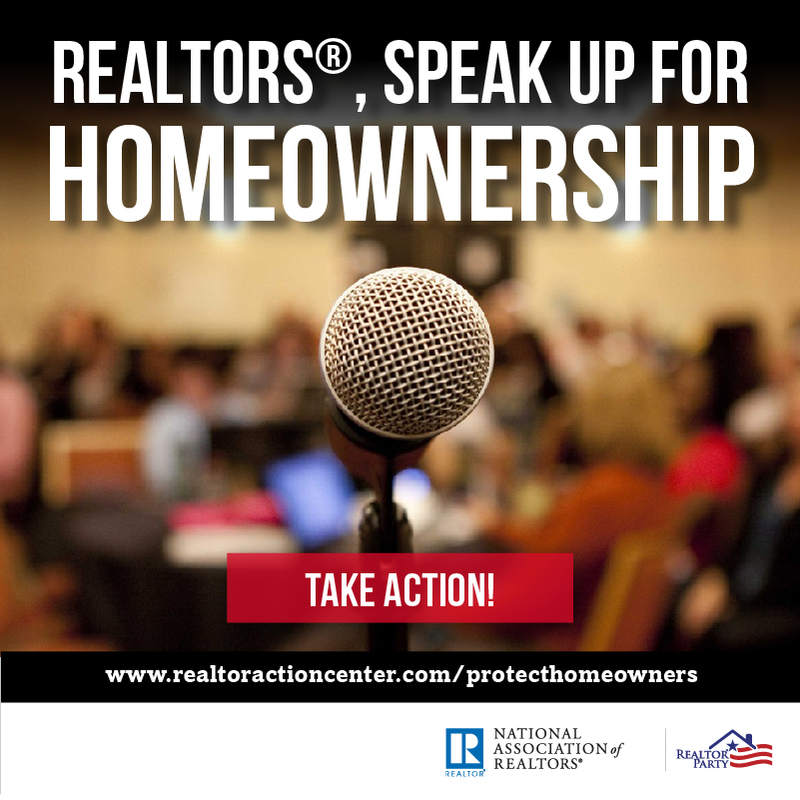 "Realtors® know first-hand what happens when the NFIP expires, and it isn’t good for consumers, businesses or our communities," said NAR President Elizabeth Mendenhall, a sixth-generation Realtor® from Columbia, Missouri, and CEO of RE/MAX Boone Realty. "We appreciate the leadership that members of Congress have shown passing sound reforms, which will strengthen the program, protect property owners and deliver good results for taxpayers." 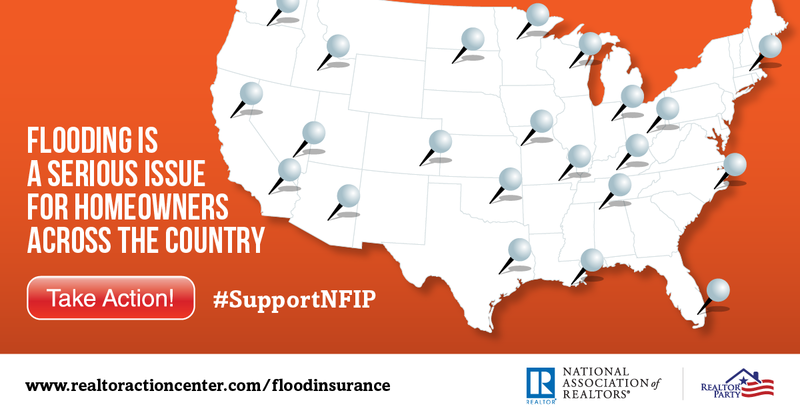 The NFIP is responsible for providing the vast majority of flood insurance policies in over 20,000 communities nationwide. Without it, most consumers would be unable to purchase the flood insurance that’s required on mortgages in a floodplain. In the past, NAR has shown that 40,000 home sales are lost every month when the program is unavailable. "The conversation happening in Washington on this issue is fundamentally about how we deliver the best results for consumers and taxpayers, and that’s a good conversation to have," Mendenhall said. "Realtors® are simply asking that Congress swiftly deliver on the promise of this program so buyers can move forward without interruption and homeowners know their most important asset is protected. With December 8 around the corner, we’re hopeful the Senate will now step up to the plate and do their part by passing a flood reform and reauthorization package without delay." The National Association of Realtors®, "The Voice for Real Estate," is America’s largest trade association, representing 1.3 million members involved in all aspects of the residential and commercial real estate industries. NAR Government Affairs representatives talk about next steps on tax reform now that legislation has passed the House. NAR opposes House and Senate versions of tax reform because it gives corporations a tax cut on the backs of middle-income homeowners. Evan Liddiard and Helen Devlin of NAR Government Affairs explain the status of legislation and answer questions from viewers of this Facebook Live event that aired on Nov. 22. NAR is OPPOSED to the "Tax Cuts and Jobs Act" tax reform plan released by the Senate Finance Committee, and its companion legislation H.R. 1 passed by the House of Representatives on November 16. For more than a century American tax policy has recognized the value of homeownership to American middle-class wealth creation, strong and stable communities, and as a driver of our nation’s economy. Homeownership is not a special interest, it is our common interest, yet Congress would place the American Dream further out of reach for millions of Americans at a time when our homeownership rate is at a 50 year low. In short, the Tax Cut and Jobs Act is a serious step in the wrong direction. This plan, like its companion in the House of Representatives, is a direct threat to homeowners and consumers. Not only will millions of homeowners not benefit from the proposal, many will get a tax increase. Additionally, homeowners could lose substantial equity from the more than 10 percent drop in home values likely to result if the bill is enacted. The companion legislation unveiled by the Senate includes changes to the exemption on Capital Gains Tax from the sale of a primary residence, elimination of the deduction for state and local taxes, elimination of the Home Equity Loan Interest Deduction, restricts the deduction for moving expenses to only active duty military, restricts the deduction for personal casualty losses to Presidentially declared disasters. All this from a bill that is supposed to improve the current system. As currently written, H.R. 1 (link is external) would eviscerate the current-law tax incentives for purchasing and owning a home for all but a small percentage of Americans (6 percent, according to the Joint Committee on Taxation). NAR’s research indicates that the average first-time homebuyer makes a down payment of less than 10 percent, meaning that millions of owners of recently-purchased homes would go “underwater” on their mortgages, and they would owe more than the homes are worth. This, of course, could lead to devastating results for families that must sell, as well as damage neighborhoods, communities, and the economy itself. The hard-won equity of millions of homeowners could be ravaged as well. Parents planning to use the value of their homes to help finance the higher education costs of children could find their resources shot, and baby-boomer homeowners nearing retirement who hoped to use their home’s equity to pay for a portion of their retirement may have to delay or revise their plans. The bottom line is that for tax purposes, owning a home would make less financial sense than renting for the great majority of Americans. This would reverse more than a century of pro-homeownership tax policy and result in untold negative economic and social implications. While this tax reform legislation is being promoted as a tax cut for middle-income families, the reality is that millions of middle-class homeowners would immediately face tax increases, while those who see a tax cut will see significantly less tax relief if they own a home than if they are a renter. H.R. 1 uses a “typical family of four” making $59,000 a year as an example of middle-class tax relief delivered by the bill. The family is renting a home, based on the facts presented, and is to receive a tax cut of $1,182 the first year after enactment. If the family owned a home with a typical mortgage for their income level, the tax savings would be 36 percent less. This may seem a minor difference to some, but the difference grows quickly as income rises. Consider again this same “typical family of four,” but this time assign them a median family income of $73,000 rather than the median household income of $59,000 as per the Ways and Means example. In this case, the renting family receives a tax cut of $1,478 under the bill, but the home-owning family would get a refund less than half what the same family would receive as renters. Finally, looking at this same family, but with an income of $120,000, as renters, they would receive a tax cut under H.R. 1 of $3,408. However, as homeowners with a typical mortgage in a typical average-cost state, they would have a tax increase of $226. This hidden “homeowners penalty” would be an astounding $3,634. Further, the Tax Cuts and Jobs Act not only eliminates the current tax advantages of homeownership, and thus discourages homeownership for many, it would actually encourage renting by allowing investors in residential property to continue to be eligible for full deductions of all interest and property taxes. To make things worse, the relatively small tax cuts that many middle-class homeowners receive from this proposal would vanish after just a few years. Based on the Congressional Budget Office forecast of inflation, income growth, and 10-year Treasury rates, coupled with the expiration of the family flexibility credit, most middle-class families would see their modest tax cuts transform to tax increases under the plan compared to current law after five years. NAR does not believe vanishing tax cuts, coupled with vanishing home equity, is a formula for growing our economy. Homeowners currently pay 83 percent of all Federal income taxes. This percentage is likely to increase significantly under the Tax Cuts and Jobs Act. At the same time, long-standing federal tax policy that recognizes the importance of homeownership to our nation would be eliminated for all but a fortunate few. 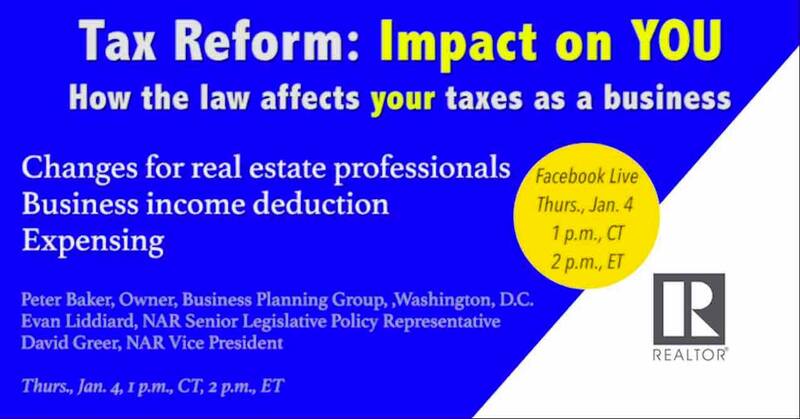 NAR cannot support these changes because REALTORS® know that tax reform can be better than this. A tax reform bill that is projected to add $1.5 trillion to our national debt should produce very few losers. Unfortunately, it appears America’s homeowners and owner-occupied real estate, in general, are by far the largest losers in this legislation.